HOBART: Maybe I'm seeing a connection where there isn't one and this doesn't apply more to writers than anyone else, but I feel like I've increasingly seen/met writers who run, bike, and are otherwise into fitness activities, often endurance type stuff. I know you're a cyclist. Tell me a little about your background with that sport. Matthew Vollmer: I used to run. Or, rather, jog. But I never stretched. So I injured myself. Went to physical therapy, where I was instructed how to sit, stand, and run. What I learned was: running properly is way more difficult than what I'd been doing. The proper form required an effort to which I refused to dedicate myself. (I have a fairly long epitaph in inscriptions that explores all this in rather excruciating detail, btw). So I bought a road bike and started cycling. I'll admit there was, in the beginning, some hesitancy. As a method of exercise, cycling definitely requires more equipment: helmet, gloves, a spandex bib, extra layers (when it's cold), protective glasses, tools for tire repair, and those special click-in shoes. (Plus, I wasn't crazy about prancing about in skin-tight leggings. Not that I have anything against skin-tight leggings. But I imagined pickup gunning rogues might swerve and--just for shits and giggles--knock me off the road.) It turns out cycling's a lot of fun--you get to go fast, for one thing--and despite its strenuousness I'm able to cycle for long periods of time and burn lots of calories, thus enabling me to eat massive quantities later, thus basically canceling out whatever calorie-reduction I could lay claim to earlier in the day. But cycling isn't about burning calories as much as it is about entering into a certain state of body/mind. As someone who writes and reads for a living, I basically sit or lie recumbent for 22 out of 24 hours every day. My body would turn to sludge and my brain to pudding were I not to force myself outside. Because I design my own daily schedule (for the most part) I often have the luxury of riding the trails around Blacksburg (where I live) during periods of minimal traffic. There, on the trails, I can imagine myself to be an actual athlete (a key element when I'm doing any kind of sport). But more importantly, once the heart rate becomes elevated and endorphins kick in, and I'm getting lots of oxygen and the stimulus of earthly delights are flashing by on all sides, I enter a mental state wherein I reflect upon the work I'm doing, and the work I need to do. Often, entering such a state is a way to figure out a problem in something I'm writing, or to generate new ideas, new concepts, new scenarios. Sometimes it means that I have to stop and actually type out a note to myself on my phone. The connections between cycling and writing are--for me--numerous. And so I shall number them. 1. Both activities are, for me, solitary (I don't write or cycle in groups, though I suppose I could). 2. I use an app to keep track of how far I ride and how many calories I burn: these numbers end up providing--not unlike the word count on the story or essay I'm writing--evidence that I've accomplished something (although what, exactly, that something is, often remains unclear). 3. Both writing and cycling require a person to be observant, take risks, and push oneself. 4. When I write I am conscious about how whatever it is that I'm working on will appear to the eyes of others; as a cyclist I am often conscious about being seen by others, and often wonder what they think: if they resent me because they're a group of walkers taking up the entire path and me yelling "approaching on your left" forces them to reorganize themselves; if I, clad in familiar types of clothing, appear familiar to other cyclists and therefore deserve an obligatory wave. 5, Both activities require a certain amount of improvisation: a writer discovers and adapts to the constraints and limitations of whatever thing they're writing, while a cyclist makes the necessary adjustments to road conditions. 6. Writing requires revision; cycling requires a knowledge of how to change a tire. 7. I claim to not to need or require the affirmation of my fellow cyclists--in fact, when a dude at my local bike shop tried to convince me, just last week, to participate in a 114-mile race called Mountains of Misery and that every cyclist in Blacksburg simply HAS to ride it at least once, I told him I had no interest at all in being authentic--and yet, the truth of the matter is that I'm not crazy about others thinking I'm a lightweight. Competitive but in no way dominant, I am a major figure in neither cycling nor literature. I have no interest in racing or beating anyone else's best time (except for my own), though I do enjoy passing other riders and hate to be passed myself (once, when a troupe of undergrads on mountain bikes--mountain bikes, of all things! with those big fat tires!--tried to pass me, I turned up the speed and then practically induced cardiac arrest in my attempt to evade them). 8. In the end, the best part of either activity--embarking on a long ride, hunkering down in the middle of a piece of writing--is simply doing them. I don't always want to brave the winds or revise a story, but once I'm deep into either, I find that I'm a much happier person. HOBART: The thought that often gets me out the door for a ride in the morning or to go the gym is always, "I'm going to feel so much happier when I've done this." And it's true. The hardest part (of exercise and writing) is starting but once you're in it, there's nothing better. In my writing classes I often use this totally lame sports metaphor to show my students how important revision is. The talk requires me to stand in front of the class, positioned as if I were holding a baseball bat. Then I swing, slowly, this imaginary baseball bat--yes, I am this ridiculous kind of teacher--and talk about how sometimes learning the proper way to go about, say, arranging an argumentative essay or something is not dissimilar the way we learn how to swing a bat or run or hit a tennis ball or ski or whatever with proper form. Usually (and helpfully, I think) this learning often feels wrong at first until you teach your body how it should be moving. This is why we go to the batting cages or hit tennis balls off the garage. You've got to break old habits by forming new ones. All that to say, I see a deep and meaningful connection between the life of the mind (writing, thinking, 22 hours of reclining) and physical activity. I'm really fascinated by that process. Do you schedule your rides in relationship to your writing day? 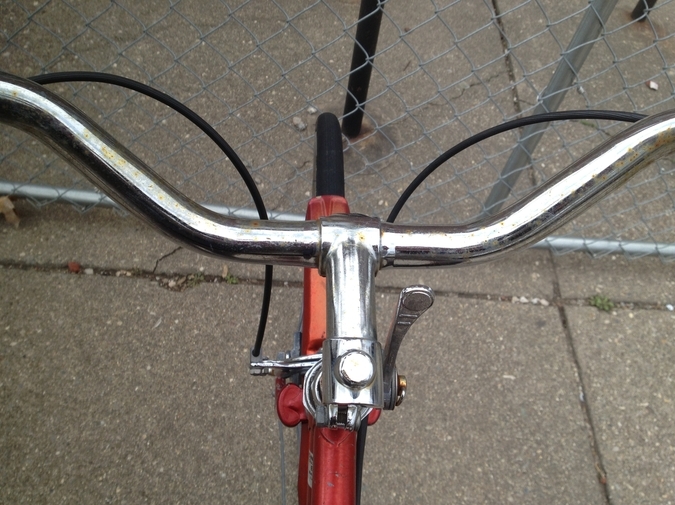 Do you ever get on your bike specifically and out of your normal schedule to solve a problem in a story? MV: My writing schedule has become--much to my dismay--utterly haphazard. I wish I could say that the first thing I do in the mornings is that I wake up at 5 a.m., drink a cup of strong coffee, and retreat to my downstairs office for two hours, where I scribble furiously into a notebook. Instead, I sleep late (of late) and though I do start the day with coffee, I also start it by visiting CNN and the New York Times and Roanoke Times (our local paper) and Gawker and Facebook and Pitchfork and Twitter and Tumblr and email. Once the news--usually a vapid, disappointing glut of useless information--has been consumed, it's time for breakfast. Then I try to fit some writing in here and there, between prepping for teaching and teaching and committee meetings and email correspondence and recommendation writing and application reading and the construction of course proposals and paper grading and book reading and dog walking and house cleaning and laundry folding and ferrying my son to and from school and soccer practice and piano lessons. But that's the way it's been for years. Writing happens when it happens; I don't always know when it will happen or for how long, only that it will. As Richard Bausch said, at a dinner I attended when he was visiting the Iowa Writers Workshop, "do a little bit of work every day." The point being that, over time, words will accrue, and projects will (eventually) get finished. As for my rides: I don't schedule those either; I just fit them in when I can. When it's not snowy or icy or bitterly cold, I try to go about 3 times a week. Lately, thanks to winter, it's less, and though I have a trainer--a steel frame with three aluminum rollers upon which a bicycle can be balanced and thus ridden indoors--I hate using it: it seems wrong to ride a bike and remain more or less stationary. And I don't usually think to myself "I'm stuck" or "I need to solve a problem" and then go for a ride. Maybe it's because I'm working on so many things at once and they all have their own chorus of problems. If I tried to solve them all by jumping on a bike, I'd never get off. HOBART: I'm definitely more of the "a little bit of work every day" tribe too. I've often wished I could be more managed and deliberate in my writing schedule, but life (and the internet, and half price whisky at a bar here in town) just gets in the way. I frequently wish I could be more disciplined with my exercise too. My workout regimen is so sloppy in so many ways. I've got a vague sense of what I want to do on any given day, but executing it is another question altogether. I'll skip exercises, do too few reps, default to what's familiar, comfortable. On the bike, I'm slightly better. I can really push myself to do more miles, harder rides, etc. But I'm still not as goal-oriented as I'd like to be. I'd probably never be able to train in any focused way for a marathon or a triathlon or anything. You mentioned that you're interested in beating your times. Do you find that you're able to set goals for yourself in your riding (in spite of the lack of firm training schedule), add miles, finish a ride quicker than the week before, etc.? What about in your writing? Do you set long term goals for yourself? You've written a story collection Future Missionaries of America, Inscriptions, which is a collection of texts that all sort of exist in between genres, I'd say, and edited an anthology. Do you try to work in a variety of genres? Or do you more just chase after opportunities and projects as they come up? The ways in which a career play out are, of course, so personal and so dependent on so much. Some writers I know have definite opinions on the sorts of books they want to write, some seem less planned and just produce the books that come. Is this something you think much about as a writer? As a teacher? MV: INSCRIPTIONS FOR HEADSTONES taught me to write what I wanted to write. To lay bare my obsessions. To channel the energy of the sort of thinking I do that isn't necessarily helpful in terms of personal development. To zero in on humiliations, devastations. But I also felt liberated, in a way, because I was focusing all my energies on sentence writing, on language, and on using my imagination to animate stories and thoughts and ideas that I had lived and that were living inside me. And I want to keep doing that. On tap: a series of meditative prose things inspired by numbers (addresses, measurements, zip codes, phone numbers, jersey numbers, bible verses, distances, etc.) that claim dominion over me and have become, somehow, mythical. 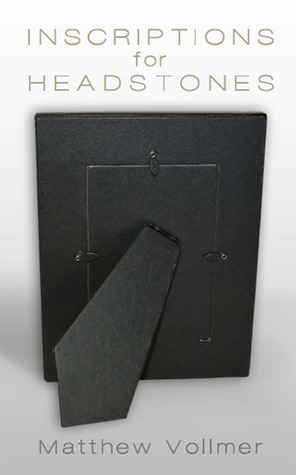 Also: a modern prayer book. Maybe: a book that traces the amazingly varied trajectories of kids I attended boarding school with, whose hands I held out under the stars as I sang praise songs. All of these projects just happen. I'm trying to be more open, to be a conduit for language, to focus on letting language use me. Matthew Vollmer is the author of Future Missionaries of America. He is also co-editor of Fakes: An Anthology of Pseudo-Interviews, Faux-Lectures, Quasi-Letters, "Found" Texts, and Other Fraudulent Artifacts. He teaches in the MFA program at Virginia Tech.